Disney has hammered out a proposed settlement with the visually impaired guests. 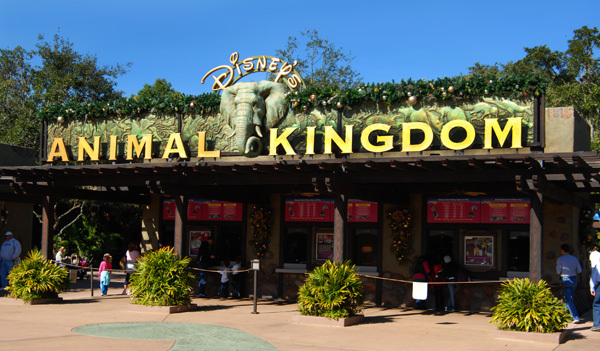 In their lawsuit, the guests alleged that Disney’s U.S. theme parks and its website(s) fail to comply with the Americans with Disabilities Act and California law. I’ve written two prior posts about this class action lawsuit. The first was when the federal judge certified the lawsuit as a class action. The second, when it appeared that Disney and the plaintiffs would be trying the lawsuit (though even here I expect a settlement to be forthcoming). If you want more information about the allegations, I suggest you read these posts. This one is going to try to explain the settlement terms and, since the proposed settlement document and attachments is 95 pages, I’ll admit to feeling pressed for space. In federal court (and most state courts) the judge must approve any class action settlement. Interested persons may object to the proposed class settlement in whole or in part. The best example of this is when several groups, including the United States Department of Justice, objected to Disney’s attempt to settle the Segway class action lawsuit (appeals in that are still pending). [The proposed settlement] will enhance existing access to Disney’s theme parks in Florida and California, their attractions and amenities for class members (i.e., guests with visual impairments) and will make Disney’s related websites more readily accessible as Disney redesigns those websites in the coming years. The settlement will also provide class members with multiple means of accessing information about parade and show schedules and menus and purchasing tickets and making reservations online. The settlement also provides increased choices for class members with service animals to visit rides and attractions on which their service animals cannot ride, as well as enhanced assurances of access to all class members to parade viewing areas at Disney’s theme parks and enhanced access to lockers and parking at the Disneyland Resort. This relief arguably exceeds legal requirements and will be effected faster and with less risk than it could be, if at all, through litigation. The settlement resolves the claims in each of the five certified classes. It also, however, resolves all the other claims the visually impaired guests brought in their complaint, including those the court refused to certify as a class. Disney didn’t want to settle part of the lawsuit so the settlement “realigns” the classes to cover all the allegations being settled. Now there are four proposed classes and each has unique settlement terms. I’ll try to generally explain what the settlement provides for each class. But first, to be clear, the settlement affects Disneyland and Walt Disney World, their websites, as well as the website for Disney Cruise Lines. It does not, so far as I can tell, require physical changes or policy modifications for any of Disney’s cruise ships. To settle the “effective communication” class, Disney agreed to provide a telephone service that will, upon request, read and answer questions about menus at theme park restaurants as well as answer questions about parade and show schedules. This service will be maintained until the information becomes available on the “next generation of the Handheld Device or is posted on the www.disneyland.com or www.disneyworld.com websites in screen-readable format.” Disney also agreed to “maintain and reinforce adherence to its current policy that employees read menus upon request to the extent requested by individuals with visual impairments.” Menus will eventually be available on the next generation of the Handheld Device. Braille menus will be made available at four major restaurants in each theme park (these are listed on the last page of the proposed settlement agreement). 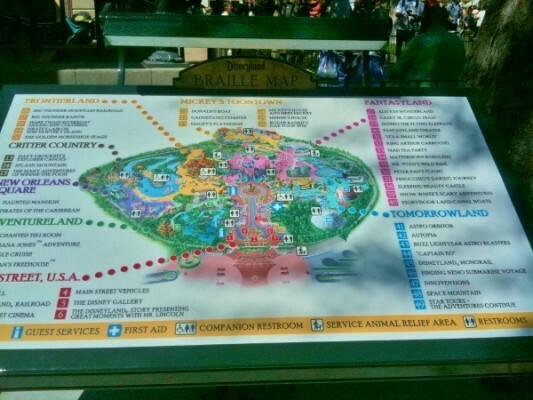 Disney also agreed to ensure that there are “two stationary Braille maps, as well as portable Braille maps for loan, for each Disney Park.” One stationary Braille map was recently installed at Disneyland. The “website class” settlement will require “mammoth” changes to the Disneyland, Walt Disney World, and Disney Cruise Line websites. This aspect of the settlement required extensive negotiation because Disney’s websites are constantly changing and “pose unique problems as they promote resorts with visually-intensive amenities and attractions based on themes and characters from even more visually-intensive works. In some instances, this material simply cannot be made fully-accessible to many members of the Website Class. In others, the amount of information on a page is so great that full accessibility would be undesirable.” Disney agreed to adopt a “written policy memorializing its commitment to website accessibility” and to adhere to certain technical accessibility standards (the settlement got quite geek at this point). The proposed settlement establishes several milestones for completion of website modifications. For example, “by December 31, 2012, users utilizing screen-readers will be able to access a majority of the content-related pages and all menus currently posted on www.disneyworld.com, as well as sample menus for all table service and quick service restaurants at the Disney Parks at the Walt Disney World Resort.” Until then, a 24-hour telephonic service will be available solely to users of screen-reading software so that they can purchase tickets and passes and book hotel rooms. There are several exceptions, such as for live webcasts and content provided by users. The “infrastructure class” settlement wraps up various theme park issues, including allegations the court refused to certify for class action status. One of the chief complaints by the visually impaired guests was that they could not use parade viewing areas reserved for guests with other physical impairments. Disney agreed to revise its operating guidelines to “clarify that parade viewing areas reserved for individuals with impairments are also available to individuals with visual impairments.” At Disneyland, Disney also agreed to install five keyed lockers for use by visually impaired guests. Disney will also make changes to parking lots at Disneyland to ensure these lots comply with ADA requirements. Clearly, the principal point of the settlement is to have Disney make prospective changes to their theme parks and websites. But Disney also agreed that the class plaintiffs can apply to the court for a “service award” of up to $15,000, which Disney will pay directly to them. The point of this award, the proposed settlement states is to pay the class plaintiffs for their time in providing “information to Class Counsel, assisting with disclosures and feedback to Disney, responding to Disney’s discovery requests, and appearing and testifying at depositions noticed by Disney.” Disney also agrees to pay up to $1,550,000 in attorney fees and costs with the precise amount to be determined by the court as part of the class settlement. Since this is a proposed settlement of a class action, the next step is that the court will determine whether it is a fair settlement. Anyone who is potentially covered by the settlement terms has the right to object to it and the court will then have to decide whether those objections preclude approval of the settlement in whole or in part. If the objections are significant, the judge can reject the proposed settlement. There is, however, a powerful impetus to approve complex class settlements such as this. Must Disney Parks Do More to Accommodate Visual Impairments?